UNAVCO finished up its second round of field support for the PLUTONS project in early November of this year. PLUTONS is a collaborative effort involving The University of Alaska Fairbanks, Cornell University, Montana State University, Oregon State University, The University of Alberta, University of Bristol, UC Santa Cruz, and multiple organizations from Chile and Bolivia. The goal of the project is to study two areas of surface uplift in South America that are potentially related to supervolcanoes. 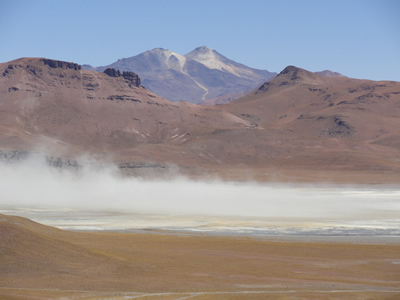 The primary location of interest is Uturuncu Volcano on the Bolivian Altiplano. The mountain is located in an area with a history of supervolcanic eruptions. In April of 2010, three continuous GPS stations were installed on and around Uturuncu. Each was revisited this month for routine maintenance and data download. The secondary area of study is the Lazufre region of uplift, situated between Lastarria and Cordon del Azufre volcanoes in northeastern Chile (near the Argentine border). One new GPS station was installed as close to the center of this deformation as possible. 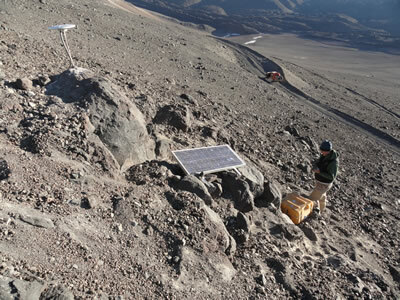 A second station was placed high on the side of Lastarria Volcano. A third was installed approximately 15 miles to the northwest of the deformation center as a control point. It is expected that this station will show very little uplift. 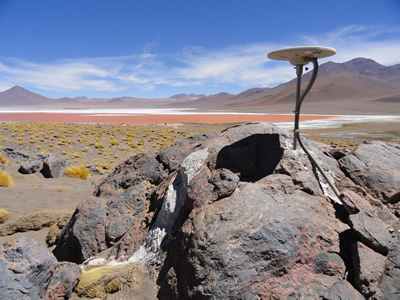 Each new Chilean GPS site received a Trimble NetRS receiver, Trimble Zephyr Geodetic antenna, a 75 watt solar panel, and a Hardigg-style battery enclosure. These stations are constructed identically to the Bolivian sites and are currently without communications. Data will be manually collected twice annually. Figure 1 - Uturuncu volcano from the South, near one of the PLUTONS seismic stations. Figure 2 - Existing GPS station built in April of 2010 at a distance of 40 miles from Uturuncu volcano. It is expected that data from this site will reveal no uplift. 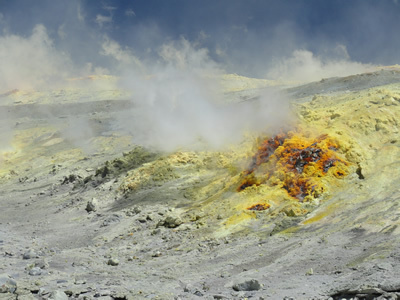 Figure 3 - Active Fumaroles on the side of Lastarria Volcano. Figure 4 - GPS in high places. At 5,230 m elevation, Matt Pritchard helps put the finishing touches on the Lastarria Volcano site.